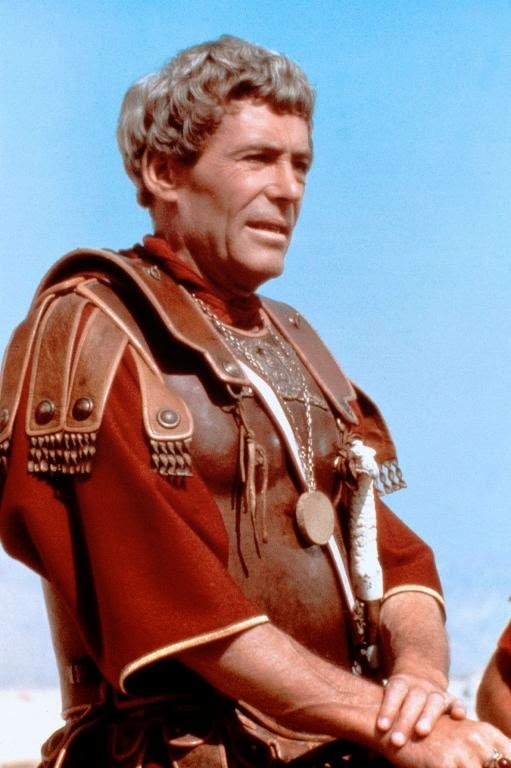 General Cornelius Flavius Silva in the 1981 mini-series "Masada"
It was just about a year ago that Peter O’Toole died (He died Monday, December 14, 2013), and I made a note to eulogize him. He was a great actor, best known for his role in “Lawrence of Arabia”, but in the 1980s he made his mark on television. It all started with Masada with Peter Strauss in 1981. It was at a time when the television mini-series was a major television event. This one followed the journey of 900 Jews, led by Eleazar ben Yair (Peter Strauss), who are under siege and hold out on the mountaintop of Masada, against a Roman Legion five times their size, led by General Cornelius Flavius Silva (O’Toole). By the time they enter Masada, the rebels had committed mass suicide knowing what their fate otherwise would be. O’Toole was nominated for an Emmy for his role. What followed “Masada” was a string of TV movies. O’Toole played an old singer coaching a younger one in "Svengali" in 1983. Later that same year he played Henry Higgins in a television adaptation of “Pygmalion”. In 1984, he played Lama in “Kim”, where a young Indian man is trained to be a spy by the British. He rounded out the decade playing Silas Ruthyn in the 1989 TV mini-series “Uncle Silas”. A movie I watched him in during that period was the theatrical release “Supergirl” in 1984, where Helen Slater played the super hero and cousin of Superman. O’Toole played a forgettable role as a Kryptonian whose actions lead to Supergirl having to come to Earth. O’Toole was panned for the role, and was even nominated for a Rassie award for worst actor. He was back in 1985 with “Creator”, where he plays a scientist who is looking for a way to clone his dead wife. Then in 1986 he was in “Club Paradise” where he starred alongside Robin Williams. He finished up the decade playing R.J. Johnston in “The Last Emperor”, a movie about the last emperor of China. It just proves that good actors are good actors, no matter where they act. Although Peter O’Toole was best known for his work in motion pictures and the theatre, he still chose roles to showcase his talents on television. The result was such stellar work as “Masada”. His talent will be sorely missed.